A SACRAMENT is at the very least an outward sign of an inward grace, and “it is hard to imagine a sacramental life evolving from any religion other than Judaism,” writes liturgical scholar James White. The Jewish people, after all, knew that their God was transcendent yet also used material objects to communicate with his people: the burning bush, the pillar of fire, the emblematic actions of the prophets. In Greek, these acts were called mystérion, a word usually translated as “mystery,” but very much meaning the kind of mysterious act in which God shows himself to us. Later, Tertullian (c. 160–c. 220) translated this with the Latin word sacramentum, which soldiers used to denote oaths they took and intended to keep. While clearly God bestowed grace through these acts, the church experienced them long before it precisely defined them—or numbered them, although baptism and Eucharist were always on the list. Today, Roman Catholics, eastern Orthodox, and Anglicans name seven rites as sacraments (see image and caption on p. 34). Protestants other than Anglicans usually limit the list to baptism and Eucharist. But for many centuries, the list and definitions were not so clear. Tertullian’s On Penance and On Baptism (c. 200) are more practical handbooks about how to perform and undergo these rites than they are theological reflections. Lectures for catechumens (people undergoing the rigorous multiyear process to prepare for baptism) by Cyril of Jerusalem, Ambrose of milan, and John Chrysostom (347–407) reflect at some length on what baptism means, but it was Augustine (354–430) who began to get more specific. He defined a sacrament memorably as “a visible word,” discussed the “invisible grace” that came through the “visible form,” and distinguished between the act itself and its power. In the Donatist controversy over who is entitled to perform the sacraments, Augustine famously argued that the sacraments communicate grace because of God’s power, not the power or the moral character of the humans who administer them. Ashes to baptism: the breadth of early sacramental practiceDespite establishing categories that would define Western sacramental thought for centuries, Augustine’s list of sacraments is tremendously wide-ranging by modern standards. It includes the baptismal font, the giving of salt at baptism, the Lord’s Prayer, the nicene Creed, easter Day, and the ashes placed on the forehead in the ceremony of penance. Other writers came up with other lists, with some overlap but little consensus on exactly what each sacrament signifies. 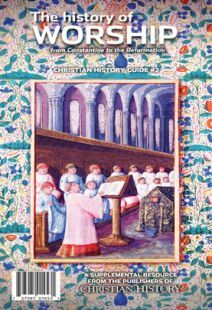 Besides baptism and the Eucharist, public repentance (originally a one-time event), anointing of the sick for healing, marriage (despite its taking place at the door of the church and not inside), and some kinds of rites surrounding Christian death and burial all took on sacramental importance in the early medieval church. But these by no means exhausted the possibilities. Even by the twelfth century, as the church was finally formalizing its thoughts on sacraments, Hugh of St. Victor (1096–1141) maintained that blessing palms, receiving ashes, bending the knee in prayer, monastic vows, saying the Creeds, dedicating a church, and death and judgment were all sacraments. The third Lateran Council of 1179 named to the list both the ordination of priests and the burial of the dead. The man who finally nailed down this ever-evolving list was Peter Lombard (c. 1100–1160), a professor of theology and the bishop of Paris, who, in about 1150, wrote the influential Four Books of Sentences. In it he writes, “now let us approach the sacraments of the new law, which are baptism, confirmation, the bread of blessing (that is the Eucharist), penance, extreme unction [anointing of the dying], orders [ordination], marriage. Of these, some provide a remedy against sin and confer assisting grace, such as baptism; others are only a remedy, such as marriage; others strengthen us with grace and power, such as the eucharist and orders.” He proceeds to describe each of the seven, using Augustine’s distinction between the invisible grace and the visible form but adding a third concept—that a true sacrament consists of the combination of both. One of the most important aspects of this refining was the word that came to define roman Catholic eucharistic theol-ogy for both its proponents and its detractors—“transubstantiation.” While the church had maintained for centuries that Christ was present in the eucharist, this word first appeared in the twelfth century to describe exactly how he was present in terms drawn from the philosophy of Aristotle. Christ’s blood and body were actually present on the altar in substance, but they still looked like bread and wine on the outside, in what were called the accidents. Later, in the reformation, this term would give rise to much controversy.